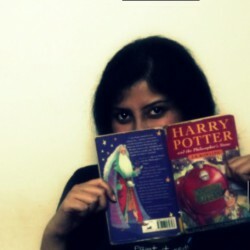 I've come to realize that I have sort of a "love-meh" relationship with Neil Gaiman's books. While I absolutely adore his books that are targeted towards a younger audience (Coraline; The Graveyard Book; Fortunately, the Milk), I somehow cannot bring myself to be more than mildly interested in the others, which are mainly for adults (American Gods, Anansi Boys, Good Omens). Maybe it's because Gaiman is PHENOMENAL at writing for kids. His words, the imagination behind his stories bring out the kid in you that the jaded experiences of life has buried deep within. It is a pleasure to just open this book and get lost in a time-travel adventure involving pirates, a Stegosaurus, volcano Gods, globs of gooey aliens and confused piranhas, all because someone went out to buy some milk, one day. I wish Gaiman wrote more books for children. This is SUCH a delight to read. 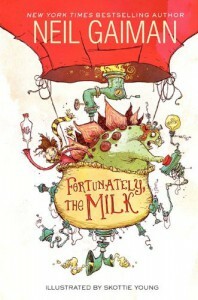 And the accompanying, brilliant, almost Tim Burton-esque illustrations by Skottie Young make it even more so!